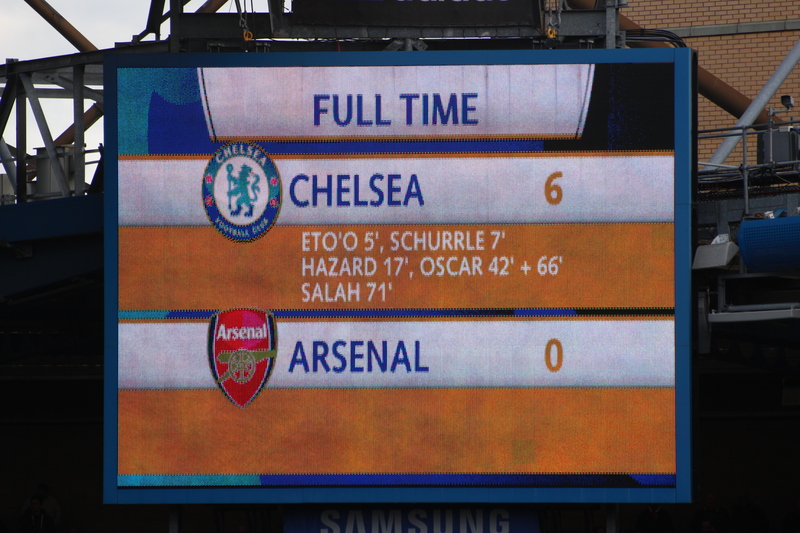 Chelsea vs. Arsenal : 22 March 2014. In many ways this Chelsea Saturday was similar to so many other Chelsea Saturdays that I have been detailing over the past five or six seasons in this series of match reports. As the words tumble out of my head and onto my laptop and then eventually onto the internet, it is quite likely that veteran readers will spot familiar themes and possibly even repeated sentences that I have aired before. This, I suppose, is the result of my Saturday routine being relatively constant; it is also the result, thankfully, of supporting a hugely successful football club. I was up early. The crisp morning air was so refreshing and it stirred me. After waking at the ridiculous time of 6am and having walked out to my car to deposit my match day essentials – coat, camera, coffee cup – within it, there was a noticeable spring in my step. I felt like “Spring-heeled Jim” – or something similar. It was a gorgeous sunny morning, we were playing Arsenal and London was calling to the faraway towns. This was going to be a good one. Lord Parky was collected bang on 7.30am and even this simple act brought me a ripple of pleasure. It was lovely to see his smiling face; he too, was excited about the day ahead. The usual routine was followed; a breakfast en route, strong coffees, the M4 east, the Wiltshire countryside racing by, New Order’s “Technique” album on the CD player, Parky’s voice booming, talk of Palace next Saturday, then Paris soon after. Mile, mile, mile, smile, smile, smile, zoom, zoom, zoom. After only two hours since I collected His Lordship, we were parked up. There was a cold wind blowing down the North End Road, but the brilliant blue sky suggested warm weather as the day unravelled. Not for the first time I had made arrangements to meet up with a first-time visitor from the US for this game. While I waited for Natalie and her mother Sandy to arrive outside the megastore, Parky chatted to a steward that he knows from The Shed. She mentioned that Chelsea received a pat on the back from UEFA because no pyrotechnics were spotted within the ranks of the Galatasaray fans at last Tuesday’s game. I presumed that some Turkish fans had tried to smuggle some flares in to the game, but had lost this battle with the stewards during the usual search of coats, pockets and bags. Ironically, I had my own personal battle with a steward in the MHU last Tuesday. As most people are surely aware, I take many photographs on a typical match day. Officially, cameras are not allowed in football stadia because they breach copyright laws; officially, that is. As everyone knows, thousands of photographs are taken at every game by fans these days, using a variety of cameras and phones. A blind eye is usually turned. However, one of my lenses literally “sticks out a mile” and so – despite using it at games for the past few years – a steward has recently spotted me and a battle of wits has ensued. On Tuesday came another warning. What disappointed me most on Tuesday was the way that the steward spoke to me. I am a season ticket holder of some seventeen years, yet was rudely warned of a letter from the club and even the confiscation of my season ticket. It left me annoyed and dismayed to be honest. Only at football are customers treated so poorly. However, I am no fool; for the next few games I am going to lie low and only use my normal wide-angle during games. It is a small price to pay. Outside the busy megastore, I looked up and spotted a familiar face from far away. I first met Jon, an ex-pat who now lives in Boca Raton in Florida, out in Chicago in 2006 and again in New York in 2012. He was here with his wife and two boys and his father. This was a nice surprise for both of us; it was the first time we had bumped into each other at Stamford Bridge. This was a big day for him; his youngest son Kyle was one of the two mascots. I always remember first meeting Jon outside the Chelsea hotel in Chicago. I had been tipped-off by a friend that Chelsea were staying close to where I was lodging, just off the Magnificent Mile. Jon, who is a travel agent, had a more unique way of working it out. He picked out the three most expensive hotels in downtown Chicago and decided to call each in turn. He phoned the first one – I think it was the Grand Hyatt – and gambled. He asked to speak to Mr. Frank Lampard. To his pleasure, he was put straight through. Ten minutes later, Jon was outside on the pavement, chatting to me. Good times. Of all my visits to the US following the club, Chicago was one of the best. Natalie had already seen three Chelsea games – New York 2012, St. Louis 2013 and Miami 2013 – but this would be her Stamford Bridge debut. Natalie used to play football – a striker – but suffered the same injuries as our own Fernando Torres. She said that she felt a bond with him; he is her favourite player. I was keen to find out what Natalie had made of her first week in London; it was all positive. There was talk of the game ahead, mutual friends, rivalries, the NFL in London, the dreaded 39th game, London itself, friendship scarves, hooliganism, past players, college basketball; no stone was left unturned. While I escorted Natalie out as kick-off time approached, Parky guided Sandy out into “Frankie’s” where she would watch the ensuing game; I had, unfortunately, been unlucky in my search for a second ticket. There was a longer-than-usual wait at the turnstiles of the Matthew Harding and I felt annoyed with myself. Not only would Natalie miss a little of the immediate pre-match routine, but I would miss out on getting some photos of Kyle for Jon. However, I joked that this indeed was turning out to be a normal Chelsea match day; it is typical Chelsea to stay in the pub for “one last pint” and only reach our seats with seconds to spare. I wished the troublesome steward a courteous “good afternoon” and we took our seats alongside Alan. I quickly scanned the team and saw that David Luiz was partnering Nemanja Matic at the base of the midfield, with Andre Schurrle alongside Oscar and Eden Hazard. Sadly for Natalie, Mourinho went with Samuel Eto’o and not Fernando Torres. I cared not who was playing for Arsenal. Natalie was impressed with the view; she had been on the stadium tour during the week, but this was the real thing. A packed house, sunny blue skies, a London derby. Arsenal – ironically in the circumstances – created the game’s first chance when Giroud broke into the box and shot low to Petr Cech’s left. Thankfully, our tall goalkeeper was able to drop quickly and touch it away; it was a fine save. Our response was immediate and dramatic. We broke at speed with Schurrle playing in Samuel Eto’o on the right. Just like against Galatasaray on Tuesday, Eto’o advanced into the inside-right channel and aimed. On this occasion he chose his left foot rather than his right. He curled a delightful shot past Scizieszcznnsy into the far portion of the Arsenal goal. I was right behind the path of the ball and was yelling my approval as it hit the back of the net. I turned to Natalie; joy unbounded. More followed, immediately. Matic won a ball and played in the raiding Schurrle. He quickly dispatched the ball into the same far corner. Only six minutes were on the clock. I lost my footing and fell into the row in front. Half of me wanted to scream in pain – ow, my bloody shin – and half of me wanted to scream in pleasure. Natalie was in blue heaven. Sadly, Samuel Eto’o was substituted after a knock, but Natalie was more than excited to see her man Nando replace him. Eden Hazard steadied himself and slotted the ball in. After just sixteen minutes : Chelsea 3 Arsenal 0. I had to run through my memory bank of previous Chelsea-Arsenal games. Have I ever enjoyed such a score line at Stamford Bridge? The Chelsea crowd were now in party mode. Then, miracle of miracles, the often derided Arsenal support – search for “Arsenal Away Boyz” on “You Tube “if anyone doubts me – engaged in a little bit of humorous banter. We enjoyed more possession and Arsenal were nowhere. Just before the break, Fernando Torres advanced into the box and picked out Oscar, who prodded the low ball in at close range. There was an air of joyous disbelief at the break. Natalie, quietly taking it all in, was lost for words. Elsewhere, others were more effusive. This was just lovely stuff from us and the second-half lay ahead…just lovely. At the break, former defender – and one time goalkeeper – and manager David Webb, wearing a garish raincoat, walked with Neil Barnett around the Bridge. He was warmly applauded. We don’t see much of him at Chelsea, which is a shame. You get the feeling he is a “one-off”, a unique character, his own man, a maverick. You rarely see him at Chelsea functions. For me, seeing him was bittersweet; it reminded me of the dark days of 1993, when Webby took charge of the club for a couple of months, steering us clear of relegation, but it was a time when I lost my father too. In the programme, there was an article by Rick Glanville about the “82,905” game, with previously unseen photographs. Splendid stuff. To be fair, only a few had left at half-time. The game, typically, died a little after the break. There were moments of inactivity. We prayed for at least one more goal. Torres set up Oscar whose rasping shot was tipped over. Just after the hour, out of nothing really, the ball was played to Oscar on the edge of the box. With that lovely movement of his – neat, minimal effort, so natural, so efficient – he moved the ball onto his right foot and shot at Szcizciesncny. The effort was hardly powerful, so imagine my surprise when the ball kicked up and flew past his pathetic dive. Mohamed Salah – the forgotten man of late – then replaced Oscar. After only a few minutes, the strong and determined Matic guided a great ball through the haphazard Arsenal defence and Salah was through on goal. He steadied himself. We waited. Now it was time for the Arsenal supporters to head home. The replica-shirted Goons soon left. They came to Stamford Bridge to celebrate Arsene Wenger’s 1,000th game in charge of their team, but endured Arsenal’s worst ever defeat at the hands of Chelsea in 107 years. Natalie – you certainly picked a good one for your Stamford Bridge debut. Arsenal are a bloody strange club. Let’s be honest; they are run on sound financial lines, but the club seems to be headed to eternal mediocrity due to their reluctance to gamble and to invest in the right areas. Occasionally it pays to dream. Wenger seems incapable of changing though. In many ways, the Arsenal club is still in love with him because of his ground-breaking training methods and his style of football which once charmed North London – so used to pragmatic and boring football over the years – in 1998, but now seems to be too rigid, too easy to counter, too predictable. After the game, I was able – at last – to get a photograph of Natalie and Sandy with Mr. Chelsea himself, Ron Harris, back in the crowded hotel. Then, we slowly walked past a few Chelsea pubs to the familiar area outside The Lillee Langtry, where we met up with a few of the usual suspects. Natalie had loved her Chelsea day. It had been perfect. There was already talk of her next visit. On a day of goals, the only negative – apart from the shower of hail stones which accompanied our walk back to the car – were the big wins for both Manchester City and Liverpool. They aren’t going away are they? Crystal Palace – my first visit to Selhurst Park in almost eleven years – next. This entry was posted in Season 2013-2014. and tagged 2013-2014, 39th Game, Arsenal, Arsene Wenger, Photography by Chris Axon. Bookmark the permalink.